Gall Thomson are specialists in Marine Breakaway Coupling technology with over forty years field based operational experience in delivering secure offshore hydrocarbon product transfer. The Marine Breakaway Coupling (MBC) was developed to aid the safe movement of crude oil, heavy fuel oil and similar products. In the event of a vessel breaking its mooring or a sudden pressure spike, the MBC completes an auto shut off and separates to relieve tension and pressure in the system before a catastrophic rupture can occur. The device operates without requiring the intervention of an operator or the system in the event of such an emergency. Gall Thomson?s newest launch Petal valve MBC is the Petal 17. The Petal 17 is a product of the evolution of design and manufacturing procedure to be an improved version of its predecessor. Gall Thomson already produced the lightest Petal valves on the market, but the Petal 17 is 20% lighter than anything in the current range with the additional buoyancy benefits that brings. The Petal 17 has a number of advanced design features. It has a compact robust design. 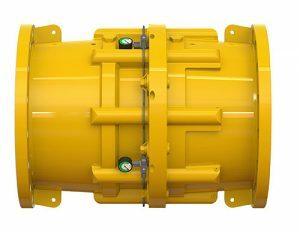 The unit is a fully sealed sleeved bore which protects the components of the unit from the corroding and eroding effects of both the product it carries and seawater. The Petal 17 has no axles, shafts, hubs or bearings and therefore no seizure points. Under normal maintenance schedules the Petal 17 can have a maintenance free period of three to five years. The MBC is totally failsafe. It fits standard flanges at any recommended location within the hose assembly. It features a full continuous bore giving zero headloss or pressure drop throughout product transfer. The unit itself is reusable. Its low pressure metal seals reliably decrease the risk of leakage on activation. There are a range of options available. The Unit Status Indictor allows the operator to conduct integrity inspections while the MBC is within the system, without the need to remove it and stop product flow. Lifting lugs can be incorporated for ease of placement, installation and manoeuvrability once it?s in the system. Locking petals minimise the threat of damaging leakage when the unit is operating in a low pressure harsh environment. The Petal 17 decreases the risk of marine pollution in an incident. It helps to prevent damage to both assets and reputation in the event of a breakaway. It decreases the possibility of costly vessel transfer down time, and of injury to personnel.